THE DÁIL WILL not be recalled to discuss the European Commission’s decision that Ireland granted illegal state aid to Apple worth €13 billion in uncollected taxes. Minister for Finance Michael Noonan requires Cabinet consent to allow Ireland to appeal the European Commission’s ruling that Apple owes Ireland €13 billion in back taxes. Cabinet is meeting today, with the Independent Alliance said to be considering its position on the issue. Fianna Fáil finance spokesman Michael McGrath has said the decision requires “careful study”. Paschal Donohoe, Minister for Public Expenditure said the Cabinet meeting will allow all ministers to “fully understand” and be briefed on the issue. That’s for other companies themselves to determine. Yes, there will be and I expect, we’ve already heard from the Revenue Commissioners that there are other companies here who engage with Irish law in the way it has been correctly set up. “It’s open to the EU Commission to do what they see fit in the future. But that’s why the Irish national interest is so clear here. The companies we’re referring to … corporation tax alone each year for Ireland is worth €7 billion. 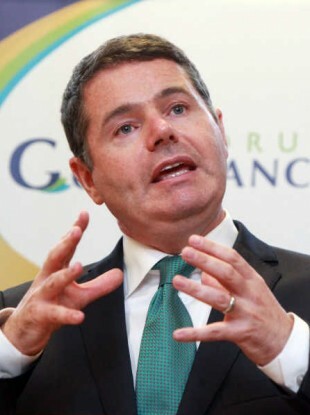 “That’s corporation tax alone, not to mention income tax, PRSI, all the other forms of taxation that are generated by the jobs here in our country,” said Donohoe. What the European Commission is now saying is the global taxation on the largest company in the world should be collected out of Ireland – even if the economic activity that creates that tax has not happened in Ireland. That upends completely the principles on which our own tax system is created, not to mention efforts to coordinate dealing with this issue globally. Donohoe added that he wants everybody to pay fair and appropriate level of taxation, but that it’s an international issue that is far broader than Ireland or Apple. He said 360,000 people either work for a large employer, or are dependent on a large employer for their work in Ireland. My main worry is what’s right for Ireland, and the particular jobs I’ve mentioned. “Ireland is not doing all of this on its own. The situation we found ourselves in is that the European Commission is saying that all of Apple’s global economic activity should be taxed out of Ireland. That is not right. The consequences of that pose a direct challenge to the way we manage job creation in our country. That’s why I’m clear on the right course of action. Eamon O’Dea of the Revenue Commissioners said the Apple tax problem is an international issue that should not be laid at Ireland’s door. “The essence of yesterday’s ruling was that Ireland, through Revenue, gave a preferential benefit, an advantage, a preferential advantage by not charging its global profits, its worldwide profits that would have produced this €13 billion,” he said. Revenue has to operate by applying the Irish tax law, and Irish tax differentiates between companies that are resident in Ireland and companies that operate through a branch. He said the two Apple companies involved were not resident in Ireland for tax purposes, and he said while somebody may be owed the €13 billion, it’s not Ireland. “We welcome that there is a new €13 billion and probably a further €4-5 billion in interest that will benefit Irish taxpayers into the future. “And I think whatever decision Apple takes, the idea of an Irish government refusing to collect taxes that it is legally entitled to as a result of the Commission’s decision and that it is willing to spend hundreds of thousands of euro defending Apple’s position, and wants to spend more taxpayers’ money is simply not acceptable. Ireland has facilitated tax avoidance through its tax code for many, many years. If the government was acting in the interests of the Irish people, it would be collecting the billions of euro that it is due. “Let’s put this into context, it’s roughly the overall cost of running our health service. This government is willing to take me and other people who haven’t paid their water charges to court, when the bill runs to €500. It’s willing to spend hundreds of thousands of our money to actually defend Apple’s interests and go to the European Court of Justice so Apple don’t have to pay tax that is liable to the Irish taxpayer. It’s simply not acceptable. Labour, however, will support a Government appeal of the European Commission’s decision. Leader Brendan Howlin said it was “inconceivable” that Ireland would not be attached to Apple’s appeal of the decision. Meanwhile, Cork North Central TD Mick Barry has questioned Minister Noonan’s assertion that the tax would not be available for current spending. “A cynical attempt was made to pull the wool over the eyes of the public by saying ‘even if we get the money, we can’t spend it anyway because of the fiscal rules’,” Mr Barry said. This has been exposed as untrue after the intervention of EU Commissioner Vestager and the admission by Minister Paschal Donohue on Drivetime that any funds received by the State through the ruling could be spent on capital projects such as housing. Email “Government expresses fears for jobs after EU decision 'upends' our tax system”. Feedback on “Government expresses fears for jobs after EU decision 'upends' our tax system”.